Just in case your French is rusty, the title "Les III Vinyles" means "The Three Records". Maybe you figured that out on your own. 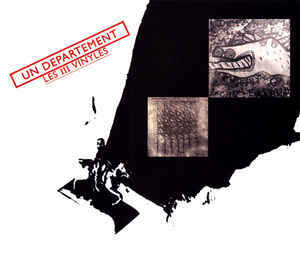 This album collects Un Département's self-released 12" and 7" and their full LP, released by Illusion Production, all of which originally appeared between 1981 and 1985. The CD here was released by Infrasition in 2008. Thank you, another collection of little jewels! I'm looking for "Un Département - Des Nouvelles" [2005-Les Compagnons De La Tête De Mort].